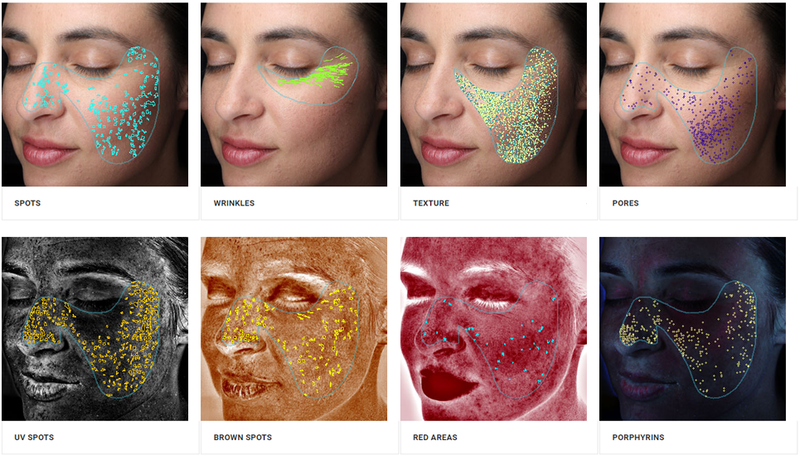 VISIA is a revolutionary computerized system for analyzing a patient’s complexion to determine their overall skin condition – so that together we can select the best skin care treatments and products to target their unique skin damage issues. 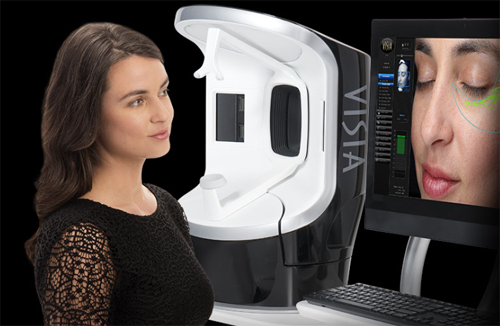 VISIA delivers the most comprehensive skin care consultations, offering computerized image capture with automatic skin type classification, refined facial feature detection, eight types of quantitative analysis, and more. A capture module rotates smoothly around the patient, while they sit comfortably in our Birmingham, MI Med Spa. The entire process only takes a matter of minutes! The facial images are then processed by VISIA’s proprietary 7th generation software. An easy to understand personalized printed report will be delivered, for the patient and Dr. Ali to use in treatment planning. Dr. Ali will explain the results contained in the report, and take the time to recommend the best skin care treatments and products based on the findings of the skin analysis. As patients consider their aesthetic treatment, they can also conveniently view their images, treatment recommendations, and progress at home – using a secure (password protected) web portal. VISIA truly is the future of skin care, available now in our Birmingham Med Spa! VISIA – The Future of Skin Analysis is Now! VISIA’s patented software analysis uses the world’s largest skin feature database to compare your skin relative to others of the same age and skin type. VISIA measure age spots, wrinkles, texture, pores, UV spots, brown spots, red areas, melanin (pigment), blood vessels and porphyrins (a substance in the body that causes changes in skin color). VISIA can also simulate how a you might appear from ages 18 to 80 years old! And the VISIA 3D Viewer visualizes the skin’s actual surface in three dimensions from any angle. Now Offering VISIA Skin Analysis at Our Birmingham, MI Med Spa! As the module rotates around the patient’s face, IntelliFlash®, cross-polarized and UV lighting measure and record the surface and sub-surface conditions of the patient’s skin. UV photography is utilized to collect information on, and assess, any sun damage. While UV fluorescence imaging is used to reveal “porphyrins” that are responsible for certain skin discolorations. Another advanced technology called “Canfield’s RBX® Technology” is then used to visualize any conditions that result in color concentration, such as spider veins, hyperpigmentation, inflammation and other conditions.